Arriving at the converted church that is Salisbury Arts Centre, my home for the 48 hours of Bedding Out, the altar stage looked breathtakingly beautiful. Plotted and planned as it was, I was not prepared for the theatre of it: a wall of white drapes behind the bed picking up on the white of the bedding and echoing the large canvas sails suspended above; the red of the bed throw picking up in colour the stained glass that rose high above the drapes; the black of the stage adding drama and the wooden frame of the bed, warmth. Above me, my view from the bed, black rafters criss-crossed the underbelly of the roof. I measured the hours in fractions: 1/4, 1/3, 1/2, and on to the final 48th, interrupting them with conversations around the bed and with the world beyond through twitter. And in between I rested, recovering from one conversation and preparing myself for the next. Behind the scenes, the crew was a hive of activity, managing a livestream and a twitter feed, preparing live captioning and BSL interpretation for the next conversation, and PAing for me, all with a steady calm that carried me through the 48 hours. Through a livestream watched in 18 countries, a continuous twitter feed comprising thousands of messages interconnecting, and extra twitter conversations laid on to cope with demand, there was a sense of something extraordinary unfolding. If the conversations in the arts centre and via social media were visibly active, in the long hours between, where I looked to be sleeping, plenty of work was taking place. People have commented on how vulnerable I was making myself, revealing my private self through the performance, but the vulnerability was more in receiving such a weight of expectation, despair and urgent hope in such a public forum. For me, the 48 hours, in and between the conversations, shaped and formed my thinking about how we might understand the attack on whole swathes of our society, about how we might bear witness to the isolated pain of individuals whilst turning it towards ever-more collective resistance. In the weight of people’s stories, what I heard was the impact that public vilification can have: the bewilderment at injustice, the injustice of extreme misrepresentation, the pain of losing our fragile security, the ever-present fear of backlash. But entwined within each story was profound compassion, dignity, contribution, and resilience despite all; every story encapsulated the humanity that most of us would choose to live amongst. These are not stories of skivers and scroungers, nor do they carry the victim label that equally endangers. Beyond the bed, I am left with the question of how we interweave pain and resolve more publicly, and in a way that reflects its complexity, in order to turn it towards change. As we oppose the specific details of benefits changes, such as the points system used to assess PIP claimants, we need to site them in the context of the values that underpin and are used to justify those changes. Driving them all are the values of individualism and of some social groups as worth less. These values applied to disabled people are being applied to others too. If disabled people were the first, we were never going to be the last. Now it is unemployed people, poor people, single parents, immigrants, the under-25s; next it is to be people deemed to be earning too little. In a process of divide and rule, there is an ever-greater need for collective action between us all. In the run up to Bedding Out, I noticed the government’s increasing references to public opinion: a majority population supports these changes to benefits and other public services, believing benefit fraud to be out of control and public spending to be a primary cause of the economic crisis. Yet public opinion, as it stands, has been skewed and tainted by selective use and misrepresentation of official statistics for political gain.¹ Alongside government briefings, most newspapers continue to engage in a propaganda offensive associated with a doubling in hate crime.² The Coalition uses these falsehoods to justify a reinvented and cut-back benefits system that is leading to multiple deaths. When government sets such store by public opinion, holding it as the barometer of its re-electability, when public opinion is so central to winning the argument, then it is essential that we become the ones to shape it. If public opinion, with such devastating consequences, is being formed through invented statistics and fabulations of what we are, then we need to counter it at every turn with true facts and true stories. We need to identify who in the press (predominantly Guardian journalists) are doing the sustained investigative reporting and supply them with our stories. We need to use our own media (“tweet it, blog it talk it, live it”) in every way that each of us can in order to realise the furthest reach of our influence. New research reveals a more complex division in public opinion than most polls suggest: once people know someone affected by the cuts, they are more likely to be swayed against the Coalition’s policies.³ To shift public opinion, we need to become known. We need to reach out to the ‘good, kind and compassionate’ people who would be horrified if they only knew, or who feel disquiet but do not speak out; we need to communicate to them facts about benefits and stories of our lives as they really are and to show why it matters so much to speak out. We need to tell stories of what it is to be ‘us’, what it is to be a claimant, what social security really is and what it does, how it is really spent and the breadth of its benefits. We need to counter the values that permit labelling of some social groups as less, that foster division and scapegoating. We need to become the ones informing and shaping public opinion, mobilising it and building collective momentum. We need to create an unequivocal cry of “Not in my name,” that leaves politicians of all parties realising they have no choice but to heed us. And we need to extend beyond simple opposition to ask the big questions: what kind of society we want to be and how do we get there? We need to devise working alternatives to the current onslaught, to find out what a humane and inclusive social security system would look like and how it would be implemented and sustained. • We are hearing multiple stories of people connected, of people feeling represented and changing how they manage their public/private selves, of people integrating their health needs better and finding their ‘fear of the brown envelope’ diminished. We are hearing of people inspired to speak out as they would not have done before, countering propaganda through words and text, through art and direct action. These are stories of crisis and stories of resilience, solutions, mobilising and collective resistance. • We are amassing a bank of true facts and stories. These will be uploaded to our website and distributed via other sites and social media in easily tweetable, easily memorable bite-sized facts and stories, in tweets, blogs, links, photographs and videos, for people to call to help them in answering back. • We will re-present the twitter feed, which is filled with interesting and wide-ranging conversation and commentary, so that it becomes a permanent, practical resource with conversation threads clear, searchable and grouped thematically. • There have been repeated calls for a national Bedding Out guerrilla action, for a big splash visible representation of who and what we are, that will incorporate people in public spaces and people from their beds, and there are people beginning to work towards this. • There is interest in creating a project less visible, a peer support network in which we help each other with form-filling and tribunal-survival, building individuals’ resilience for both personal survival and opposition. If you’re interested in any of these projects, please get in touch and I’ll pass your details on to the relevant person. This week, I was asked do I really think we have a hope in hell of turning the tide, or is this just a “valiant protest” so we can say we “fought the good fight until the end”? And even as premonitions are not my thing (and perhaps not the Coalition’s either, given the state of economic recovery), what I know is this: if we don’t fight back, failure is certain. And if we do fight back, then we stand a chance. If we contest every last one of the Coalition’s and press lies, if we bite back against policy and ideology that treats whole swathes of society as less, then we stand a chance. Government has huge resources which we can only dream of, yet over the past three years I have been in awe of the strengths that have emerged amongst disability activists: skills and strategies, new alliances, deep compassion and hard won experience, complex organisation and resilience. And, strange as it may seem to call this a strength, to call it something the Coalition could only dream of, I see how raw desperation drives us. The reality is that our community, and individuals within it, are fighting for our lives, and that makes us, united, the most formidable of oppositions. 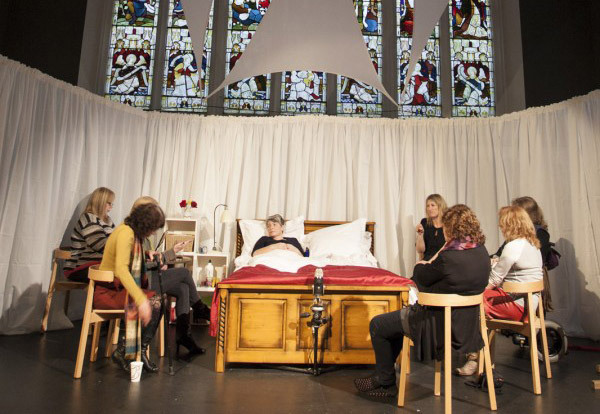 Bedding Out has been funded by Arts Council England.